The Al Shabaab Militants have posted on twitter graphic pictures of five Kenyan troops killed yesterday morning in the battle for Miido, a town close to the port city of Kismayu. Earlier yesterday Kenya Defense Forces (KDF) spokesman Maj. Emmanuel Chirchir confirmed the killing of two Kenyan troops and three others missing. In a tweet this morning Maj. Emmanuel Chirchir confirmed the missing soldiers have been found. There was no confirmation of whether the three soldiers found were dead or alive, lending credence to the photos posted by Al Shabaab could be genuine. If confirmed, it will be highest loss to KDF in a single operation yet. â€KDF corpses are now left for the dogs to devour. Welcome to Kismayu fellas,â€™â€™ Al Shabaab mocked KDF/AMISOM, in a Twitter post. The posted picture showed what appeared to be the bodies of Kenyan soldiers in uniform lying in an open dusty ground and had signs of having been dragged on the ground. Meanwhile KDF have appealed to residents of Kismayu to give them information on where militants would bury the bodies of the killed soldiers. â€To the people of Kismayuâ€¦be on the lookout where the remains of our heroes will be buried. That will be our welcome gesture,â€ said Chirchir in a twitter posting. Two of the bodies paraded had military identity cards of the soldiers, bank pin pass, Kenyan brand of cigarettes and a one thousand shilling Kenya currency note. Last Monday AMISON troops seized the port of Marka, from Al Shabaab as part of grand match to Kismayu. 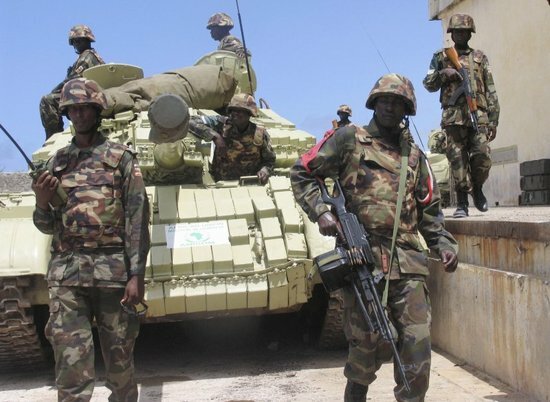 AMISOM said its fighters met little resistance in the battle for Marka, which is about 68 miles south of Mogadishu. Â According to the United Nations,the Al Shabab earned income from taxes and port fees in Marka, hence a key strategic loss to the militia. The capture of Miido town is a testimony that Kismayu is calling and could be just a matter of hours before AMISON storms the port city. The port city of Kismayu is considered to be ground zero of the battle between the AMISON and Al Shabaab militias. The port town is the lifeline for Al Shabaab. The success of KDF and AMISON in driving away the militia from the capital Mogadishu and 15 other towns has driven the Jihadists to Kismayu, the concentration of Al Shabaab in Kismayu makes the battle for Mogadisgu a grand royale . Al Shabaab claims to have saved the best for last as battle for Kismayu inches closer, the limited resources at their disposal will be put to maximum use; this may include even using human shield experts warned. For 21 years Somali has been ungovernable, facing one disaster after another. Clan militias toppled the central government of Dictator Mohamed Siad Barre in 1991 and later inter clan wars raged. Somalia is ranked as one of the worldâ€™s poorest, most violent country, plagued by warring militias, famine, warlords and pirates. The Insurgency by Al Shabaab started to be more pronounced in 2006 and has grown to be Africaâ€™s most feared Islamist group. Currently Alshabaab controls Southern Somali but with the eminent attack on Kismayu by AMISON this may change. In August 2011, the Al Shabab Â were forced to withdrew from many areas including Mogadishu, giving the Transitional Federal Government Â a chance to control more territory outside the capital and begin uniting the fractious country after two decades of war. The TFG could not fully take advantage of the defeat of Al Shabaab as the government was weak, corrupt and systematically divided, this paved way for clan warlords, Islamist militias and proxy forces armed by foreign governments to battle it out for the regions the Shabab was losing. Western countries including Britain, USA and France have pumped millions of dollars to the TFG but still viewed by many as a toothless dog led by weak and corrupt politicians. May Allah grant our KDF AND AMISOM VICTORY against the terror and criminal gang al shabbab.KUDOS KDF. The more we fight on! No going back, forward ever. KISMAYU LASIMA MPENDE MSIPENDE.KILL ONE WE KILL HUNDREDS, KDF KEEP IT UP. new update by Isaack coming up shortly!! Kismayu ndio chai jihad shabbab be ready…..